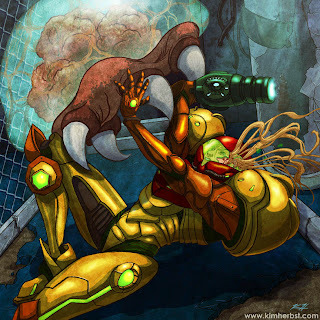 Kim Herbst - Illustration: Do it, Samus! Metroid holds a bit of a special place for me. I distinctly remember sitting in my basement as a kid, and watching my older brother play it (majority of original NES games are memories of watching him play it before I actually got my hands on experiencing the game for myself). Right after he'd just beaten the last level, Metroid reveals in the ending that --(ZOMG SPOILER?!?) Samus is actually a female under all that androgynous space-suit looking armor. That really got me, mainly because all of the games I'd been playing up until that point always starred a male character (Super Mario, Legend of Zelda, Mega Man etc.). And this female heroine was extremely awesome! I tweaked Samus's armor some because it was looking a bit outdated (according to the original NES covers and manual booklets that came with the game).